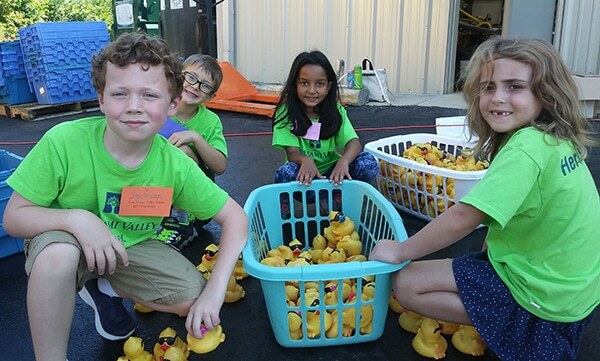 Lower school students engaged in immersive learning with math by helping at the United Rehabilitation Services annual Duck Regatta. First graders practiced counting by 10s while washing and packaging 10,000 rubber ducks to be shipped to the next regatta hosting city. Students had an opportunity to tour the URS facility and learn more about whom the organization serves. Parents even partook in an immersive “dumpster diving” experience in which they helped pull baskets of ducks out of a dumpster on a hot day. The URS Duck Regatta raises money for children and adults with disabilities through the adoption of 20,000 ducks that are dumped in the Little Miami River for a race. Our campus is an experience you need to see in person. Our doors are open. Come by and see what we are up to. We strive to make our admissions process pleasant and achievable. Apply now, and we'll begin the journey toward building a better community through education.